Atul Gawande's 'Checklist' For Surgery Success The surgeon and writer talks about the massively complicated process of keeping patients alive and shares his simple solution for how that process might be streamlined. 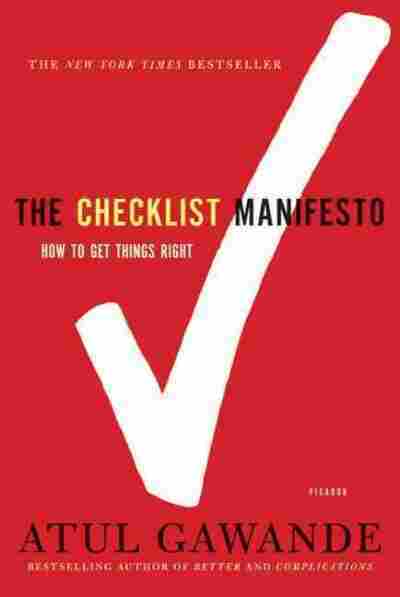 Gawande's newest book is called The Checklist Manifesto. 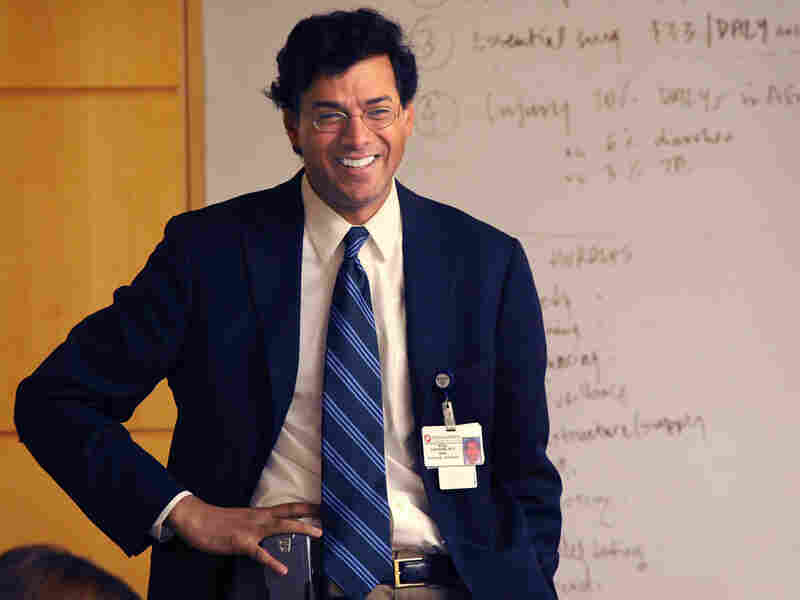 Atul Gawande is a staff member of Brigham and Women's Hospital and the Dana Farber Cancer Institute. His other books include Better and Complications. Speaking about dealing with unexpected challenges in medicine, Atul Gawande — a surgeon who writes for The New Yorker when he's not at his day job at Harvard Medical School — relates a story about a man who came into an emergency room with a stab wound. "It was a single wound, about an inch in size, in his belly," Gawande tells Morning Edition host Steve Inskeep. The man's injuries didn't appear life-threatening, but his condition quickly turned. "About 10 minutes later, he crashed," Gawande says. "When they got him open they found that the wound had gone — this is a pretty big guy — straight through more than a foot into him, all the way into his back and sliced open his aorta. And so afterwards they asked a few more questions of the family. 'How did this happen?' 'Well, it was a Halloween party.' 'What exactly went on?' And then they learned that the guy who had stabbed him was dressed as a soldier carrying a bayonet. And if they had understood it was a bayonet, they would have thought about it quite differently." Gawande uses this anecdote, a simple miscommunication with the potential to cause so much tragedy, to illustrate an argument he makes in a new book called The Checklist Manifesto: How to Get Things Right. "We brought a two-minute checklist into operating rooms in eight hospitals," Gawande says. "I worked with a team of folks that included Boeing to show us how they do it, and we just made sure that the checklist had some basic things: Make sure that blood is available, antibiotics are there." "We get better results," he says. "Massively better results. "We caught basic mistakes and some of that stupid stuff," Gawande reports. But the study returned some surprising results: "We also found that good teamwork required certain things that we missed very frequently." Like making sure everyone in the operating room knows each other by name. When introductions were made before a surgery, Gawande says, the average number of complications and deaths dipped by 35 percent. "Making sure everybody knew each other's name produced what they called an activation phenomenon," Gawande explains. "The person, having gotten a chance to voice their name, let speak in the room — were much more likely to speak up later if they saw a problem." How did surgeons respond to the suggestion that they should change the way they operate? Says Gawande, many were resistant at first. "You can imagine the response" to the idea of running through a checklist before surgery, Gawande says. But when his team surveyed the doctors who used the checklist, "There was about 80 percent who thought that this was something they wanted to continue to use. But 20 percent remained strongly against it. They said, 'This is a waste of my time, I don't think it makes any difference.' And then we asked them, 'If you were to have an operation, would you want the checklist?' 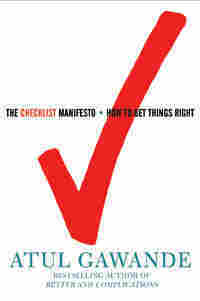 Ninety-four percent wanted the checklist." So why does Gawande think professionals have such a hard time admitting that having a reminder might be a good idea? "Partly I think we have a hard time admitting weakness," he says. "And one of the things we have to grapple with is that we have to assume we are fallible, even as experts." That's a tough pill to swallow, and one made even harder given the way in which the media and entertainment industry present profiles of people who succeed in demanding situations. "One of the things that struck me about the 'Miracle on the Hudson,' when 'Sully' Sullenberger brought the plane down that saved 155 people after it was hit by geese over Manhattan and landed it in the river," Gawande says, was that "over and over again we wanted to say, 'Look at this hero who piloted this plane down,' and the striking thing was how much over and over again he said, 'There was nothing that hard about the physical navigation of this plane.' Instead he kept saying 'it was teamwork and adherence to protocol.' "
Gawande says he experiences a similar displacement of credit when he performs a surgery. "I come out of my operations and then I go out and talk to the family and they say 'Doctor, thank you for saving my husband!' " Gawande says. "You feel a little bit like a fraud because you know how much you were dependent on everybody getting this right. And when we acknowledge it, that's when we come back to ideas like checklists." Despite all the evidence, Gawande admits that even he was skeptical that using a checklist in everyday practice would help to save the lives of his patients. "I didn't expect it," Gawande says with a chuckle. "It's massively improved the kind of results that I'm getting. When we implemented this checklist in eight other hospitals, I started using it because I didn't want to be a hypocrite. But hey, I'm at Harvard, did I need a checklist? No." "I was in that 20 percent. I have not gotten through a week of surgery where the checklist has not caught a problem." Some time ago I read a case report in the Annals of Thoracic Surgery. It was, in the dry prose of a medical journal article, the story of a nightmare. In a small Austrian town in the Alps, a mother and father had been out on a walk in the woods with their three-year-old daughter. The parents lost sight of the girl for a moment and that was all it took. She fell into an icy fishpond. The parents frantically jumped in after her. But she was lost beneath the surface for thirty minutes before they finally found her on the pond bottom. They pulled her to the surface and got her to the shore. Following instructions from an emergency response team reached on their cell phone, they began cardiopulmonary resuscitation. Rescue personnel arrived eight minutes later and took the first recordings of the girl's condition. She was unresponsive. She had no blood pressure or pulse or sign of breathing. Her body temperature was just 66 degrees. Her pupils were dilated and unreactive to light, indicating cessation of brain function. She was gone. But the emergency technicians continued CPR anyway. A helicopter took her to the nearest hospital, where she was wheeled directly into an operating room, a member of the emergency crew straddling her on the gurney, pumping her chest. A surgical team got her onto a heart-lung bypass machine as rapidly as it could. The surgeon had to cut down through the skin of the child's right groin and sew one of the desk- size machine's silicone rubber tubes into her femoral artery to take the blood out of her, then another into her femoral vein to send the blood back. A perfusionist turned the pump on, and as he adjusted the oxygen and temperature and flow through the system, the clear tubing turned maroon with her blood. Only then did they stop the girl's chest compressions. Between the transport time and the time it took to plug the machine into her, she had been lifeless for an hour and a half. By the two-hour mark, however, her body temperature had risen almost ten degrees, and her heart began to beat. It was her first organ to come back. After six hours, the girl's core reached 98.6 degrees, normal body temperature. The team tried to shift her from the bypass machine to a mechanical ventilator, but the pond water and debris had damaged her lungs too severely for the oxygen pumped in through the breathing tube to reach her blood. So they switched her instead to an artificial-lung system known as ECMO — extracorporeal membrane oxygenation. To do this, the surgeons had to open her chest down the middle with a power saw and sew the lines to and from the portable ECMO unit directly into her aorta and her beating heart. The ECMO machine now took over. The surgeons removed the heart- lung bypass machine tubing. They repaired the vessels and closed her groin incision. The surgical team moved the girl into intensive care, with her chest still open and covered with sterile plastic foil. Through the day and night, the intensive care unit team worked on suctioning the water and debris from her lungs with a fiberoptic bronchoscope. By the next day, her lungs had recovered sufficiently for the team to switch her from ECMO to a mechanical ventilator, which required taking her back to the operating room to unplug the tubing, repair the holes, and close her chest. Over the next two days, all the girl's organs recovered — her liver, her kidneys, her intestines, everything except her brain. A CT scan showed global brain swelling, which is a sign of diffuse damage, but no actual dead zones. So the team escalated the care one step further. It drilled a hole into the girl's skull, threaded a probe into the brain to monitor the pressure, and kept that pressure tightly controlled through constant adjustments in her fluids and medications. For more than a week, she lay comatose. Then, slowly, she came back to life. First, her pupils started to react to light. Next, she began to breathe on her own. And, one day, she simply awoke. Two weeks after her accident, she went home. Her right leg and left arm were partially paralyzed. Her speech was thick and slurry. But she underwent extensive outpatient therapy. By age five, she had recovered her faculties completely. Physical and neurological examinations were normal. She was like any little girl again. What makes this recovery astounding isn't just the idea that someone could be brought back after two hours in a state that would once have been considered death. It's also the idea that a group of people in a random hospital could manage to pull off something so enormously complicated. Rescuing a drowning victim is nothing like it looks on television shows, where a few chest compressions and some mouth- to- mouth resuscitation always seem to bring someone with waterlogged lungs and a stilled heart coughing and sputtering back to life. To save this one child, scores of people had to carry out thousands of steps correctly: placing the heart- pump tubing into her without letting in air bubbles; maintaining the sterility of her lines, her open chest, the exposed fluid in her brain; keeping a temperamental battery of machines up and running. The degree of difficulty in any one of these steps is substantial. Then you must add the difficulties of orchestrating them in the right sequence, with nothing dropped, leaving some room for improvisation, but not too much. For every drowned and pulseless child rescued, there are scores more who don't make it — and not just because their bodies are too far gone. Machines break down; a team can't get moving fast enough; someone fails to wash his hands and an infection takes hold. Such cases don't get written up in the Annals of Thoracic Surgery, but they are the norm, though people may not realize it. I think we have been fooled about what we can expect from medicine — fooled, one could say, by penicillin. Alexander Fleming's 1928 discovery held out a beguiling vision of health care and how it would treat illness or injury in the future: a simple pill or injection would be capable of curing not just one condition but perhaps many. Penicillin, after all, seemed to be effective against an astonishing variety of previously untreatable infectious diseases. So why not a similar cure-all for the different kinds of cancer? And why not something equally simple to melt away skin burns or to reverse cardiovascular disease and strokes? Medicine didn't turn out this way, though. After a century of incredible discovery, most diseases have proved to be far more particular and difficult to treat. This is true even for the infections doctors once treated with penicillin: not all bacterial strains were susceptible and those that were soon developed resistance. Infections today require highly individualized treatment, sometimes with multiple therapies, based on a given strain's pattern of anti biotic susceptibility, the condition of the patient, and which organ systems are affected. The model of medicine in the modern age seems less and less like penicillin and more and more like what was required for the girl who nearly drowned. Medicine has become the art of managing extreme complexity — and a test of whether such complexity can, in fact, be humanly mastered. The ninth edition of the World Health Organization's international classification of diseases has grown to distinguish more than thirteen thousand different diseases, syndromes, and types of injury — more than thirteen thousand different ways, in other words, that the body can fail. And, for nearly all of them, science has given us things we can do to help. If we cannot cure the disease, then we can usually reduce the harm and misery it causes. But for each condition the steps are different and they are almost never simple. Clinicians now have at their disposal some six thousand drugs and four thousand medical and surgical procedures, each with different requirements, risks, and considerations. It is a lot to get right. There is a community clinic in Boston's Kenmore Square affiliated with my hospital. The word clinic makes the place sound tiny, but it's nothing of the sort. Founded in 1969, and now called Harvard Vanguard, it aimed to provide people with the full range of outpatient medical services they might need over the course of their lives. It has since tried to stick with that plan, but doing so hasn't been easy. To keep up with the explosive growth in medical capabilities, the clinic has had to build more than twenty facilities and employ some six hundred doctors and a thousand other health professionals covering fifty-nine specialties, many of which did not exist when the clinic first opened. Walking the fifty steps from the fifth-floor elevator to the general surgery department, I pass offices for general internal medicine, endocrinology, genetics, hand surgery, laboratory testing, nephrology, ophthalmology, orthopedics, radiology scheduling, and urology — and that's just one hallway. To handle the complexity, we've split up the tasks among various specialties. But even divvied up, the work can become overwhelming. In the course of one day on general surgery call at the hospital, for instance, the labor floor asked me to see a twenty-five-year-old woman with mounting right lower abdominal pain, fever, and nausea, which raised concern about appendicitis, but she was pregnant, so getting a CT scan to rule out the possibility posed a risk to the fetus. A gynecological oncologist paged me to the operating room about a woman with an ovarian mass that upon removal appeared to be a metastasis from pancreatic cancer; my colleague wanted me to examine her pancreas and decide whether to biopsy it. A physician at a nearby hospital phoned me to transfer a patient in intensive care with a large cancer that had grown to obstruct her kidneys and bowel and produce bleeding that they were having trouble controlling. Our internal medicine service called me to see a sixty-one-year-old man with emphysema so severe he had been refused hip surgery because of insufficient lung reserves; now he had a severe colon infection — an acute diverticulitis — that had worsened despite three days of antibiotics, and surgery seemed his only option. Another service asked for help with a fifty-two-year-old man with diabetes, coronary artery disease, high blood pressure, chronic kidney failure, severe obesity, a stroke, and now a strangulating groin hernia. And an internist called about a young, otherwise healthy woman with a possible rectal abscess to be lanced. Confronted with cases of such variety and intricacy — in one day, I'd had six patients with six completely different primary medical problems and a total of twenty-six different additional diagnoses — it's tempting to believe that no one else's job could be as complex as mine. But extreme complexity is the rule for almost everyone. I asked the people in Harvard Vanguard's medical records department if they would query the electronic system for how many different kinds of patient problems the average doctor there sees annually. The answer that came back flabbergasted me. Over the course of a year of office practice — which, by definition, excludes the patients seen in the hospital — physicians each evaluated an average of 250 different primary diseases and conditions. Their patients had more than nine hundred other active medical problems that had to be taken into account. The doctors each prescribed some three hundred medications, ordered more than a hundred different types of laboratory tests, and performed an average of forty different kinds of office procedures — from vaccinations to setting fractures. Even considering just the office work, the statistics still didn't catch all the diseases and conditions. One of the most common diagnoses, it turned out, was "Other." On a hectic day, when you're running two hours behind and the people in the waiting room are getting irate, you may not take the time to record the precise diagnostic codes in the database. But, even when you do have the time, you commonly find that the particular diseases your patients have do not actually exist in the computer system. The software used in most American electronic records has not managed to include all the diseases that have been discovered and distinguished from one another in recent years. I once saw a patient with a ganglioneuroblastoma (a rare type of tumor of the adrenal gland) and another with a nightmarish genetic condition called Li-Fraumeni syndrome, which causes inheritors to develop cancers in organs all over their bodies. Neither disease had yet made it into the pull-down menus. All I could record was, in so many words, "Other." Scientists continue to report important new genetic findings, subtypes of cancer, and other diagnoses — not to mention treatments — almost weekly. The complexity is increasing so fast that even the computers cannot keep up. But it's not only the breadth and quantity of knowledge that has made medicine complicated. It is also the execution — the practical matter of what knowledge requires clinicians to do. The hospital is where you see just how formidable the task can be. A prime example is the place the girl who nearly drowned spent most of her recovery — the intensive care unit. It's an opaque term, intensive care. Specialists in the field prefer to call what they do critical care, but that still doesn't exactly clarify matters. The nonmedical term life support gets us closer. The damage that the human body can survive these days is as awesome as it is horrible: crushing, burning, bombing, a burst aorta, a ruptured colon, a massive heart attack, rampaging infection. These maladies were once uniformly fatal. Now survival is commonplace, and a substantial part of the credit goes to the abilities intensive care units have developed to take artificial control of failing bodies. Typically, this requires a panoply of technology — a mechanical ventilator and perhaps a tracheostomy tube if the lungs have failed, an aortic balloon pump if the heart has given out, a dialysis machine if the kidneys don't work. If you are unconscious and can't eat, silicone tubing can be surgically inserted into your stomach or intestines for formula feeding. If your intestines are too damaged, solutions of amino acids, fatty acids, and glucose can be infused directly into your bloodstream. On any given day in the United States alone, some ninety thousand people are admitted to intensive care. Over a year, an estimated five million Americans will be, and over a normal lifetime nearly all of us will come to know the glassed bay of an ICU from the inside. Wide swaths of medicine now depend on the life support systems that ICUs provide: care for premature infants; for victims of trauma, strokes, and heart attacks; for patients who have had surgery on their brains, hearts, lungs, or major blood vessels. Critical care has become an increasingly large portion of what hospitals do. Fifty years ago, ICUs barely existed. Now, to take a recent random day in my hospital, 155 of our almost 700 patients are in intensive care. The average stay of an ICU patient is four days, and the survival rate is 86 percent. Going into an ICU, being put on a mechanical ventilator, having tubes and wires run into and out of you, is not a sentence of death. But the days will be the most precarious of your life. Fifteen years ago, Israeli scientists published a study in which engineers observed patient care in ICUs for twenty-four-hour stretches. They found that the average patient required 178 individual actions per day, ranging from administering a drug to suctioning the lungs, and every one of them posed risks. Remarkably, the nurses and doctors were observed to make an error in just 1 percent of these actions — but that still amounted to an average of two errors a day with every patient. Intensive care succeeds only when we hold the odds of doing harm low enough for the odds of doing good to prevail. This is hard. There are dangers simply in lying unconscious in bed for a few days. Muscles atrophy. Bones lose mass. Pressure ulcers form. Veins begin to clot. You have to stretch and exercise patients' flaccid limbs daily to avoid contractures; you have to give subcutaneous injections of blood thinners at least twice a day, turn patients in bed every few hours, bathe them and change their sheets without knocking out a tube or a line, brush their teeth twice a day to avoid pneumonia from bacterial buildup in their mouths. Add a ventilator, dialysis, and the care of open wounds, and the difficulties only accumulate. The story of one of my patients makes the point. Anthony DeFilippo was a forty-eight-year-old limousine driver from Everett, Massachusetts, who started to hemorrhage at a community hospital during surgery for a hernia and gallstones. The surgeon was finally able to stop the bleeding but DeFilippo's liver was severely damaged, and over the next few days he became too sick for the hospital's facilities. I accepted him for transfer in order to stabilize him and figure out what to do. When he arrived in our ICU, at 1:30 a.m. on a Sunday, his ragged black hair was plastered to his sweaty forehead, his body was shaking, and his heart was racing at 114 beats a minute. He was delirious from fever, shock, and low oxygen levels. "I need to get out!" he cried. "I need to get out!" He clawed at his gown, his oxygen mask, the dressings covering his abdominal wound. "Tony, it's all right," a nurse said to him. "We're going to help you. You're in a hospital." He shoved her out of the way — he was a big man — and tried to swing his legs out of the bed. We turned up his oxygen flow, put his wrists in cloth restraints, and tried to reason with him. He eventually tired out and let us draw blood and give him antibiotics. The laboratory results came back showing liver failure and a steeply elevated white blood cell count, indicating infection. It soon became evident from his empty urine bag that his kidneys had failed, too. In the next few hours, his blood pressure fell, his breathing worsened, and he drifted from agitation to near unconsciousness. Each of his organ systems, including his brain, was shutting down. I called his sister, his next of kin, and told her the situation. "Do everything you can," she said. So we did. We gave him a syringeful of anesthetic, and a resident slid a breathing tube into his throat. Another resident "lined him up." She inserted a thin two-inch-long needle and catheter through his upturned right wrist and into his radial artery, then sewed the line to his skin with a silk suture. Next, she put in a central line — a twelve-inch catheter pushed into the jugular vein in his left neck. After she sewed that in place, and an X-ray showed its tip floating just where it was supposed to — inside his vena cava at the entrance to his heart — she put a third, slightly thicker line, for dialysis, through his right upper chest and into the subclavian vein, deep under the collarbone. We hooked a breathing tube up to a hose from a ventilator and set it to give him fourteen forced breaths of 100 percent oxygen every minute. We dialed the ventilator pressures and gas flow up and down, like engineers at a control panel, until we got the blood levels of oxygen and carbon dioxide where we wanted them. The arterial line gave us continuous arterial blood pressure measurements, and we tweaked his medications to get the pressures we liked. We regulated his intravenous fluids according to venous pressure measurements from his jugular line. We plugged his subclavian line into tubing from a dialysis machine, and every few minutes his entire blood volume washed through this artificial kidney and back into his body; a little adjustment here and there, and we could alter the levels of potassium and bicarbonate and salt, as well. He was, we liked to imagine, a simple machine in our hands. But he wasn't, of course. It was as if we had gained a steering wheel and a few gauges and controls, but on a runaway 18-wheeler hurtling down a mountain. Keeping that patient's blood pressure normal required gallons of intravenous fluid and a pharmacy shelf of drugs. He was on near- maximal ventilator support. His temperature climbed to 104 degrees. Less than 5 percent of patients with DeFilippo's degree of organ failure make it home. A single misstep could easily erase those slender chances. For ten days, though, we made progress. DeFilippo's chief problem had been liver damage from his prior operation: the main duct from his liver was severed and was leaking bile, which is caustic — it digests the fat in one's diet and was essentially eating him alive from the inside. He had become too sick to survive an operation to repair the leak. So once we had stabilized him, we tried a temporary solution — we had radiologists place a plastic drain, using CT guidance, through his abdominal wall and into the severed duct in order to draw out the leaking bile. They found so much that they had to place three drains — one inside the duct and two around it. But, as the bile drained out, his fevers subsided. His need for oxygen and fluids diminished, and his blood pressure returned to normal. He was beginning to mend. Then, on the eleventh day, just as we were getting ready to take him off the ventilator, he again developed high, spiking fevers, his blood pressure sank, and his blood-oxygen levels plummeted again. His skin became clammy. He got shaking chills. We couldn't understand what had happened. He seemed to have developed an infection, but our X-rays and CT scans failed to turn up a source. Even after we put him on four antibiotics, he continued to spike fevers. During one fever, his heart went into fibrillation. A Code Blue was called. A dozen nurses and doctors raced to his bedside, slapped electric paddles onto his chest, and shocked him. His heart responded and went back into rhythm. It took two more days for us to figure out what had gone wrong. We considered the possibility that one of his lines had become infected, so we put in new lines and sent the old ones to the lab for culturing. Forty- eight hours later, the results returned. All the lines were infected. The infection had probably started in one line, which perhaps was contaminated during insertion, and spread through DeFilippo's bloodstream to the others. Then they all began spilling bacteria into him, producing the fevers and steep decline. This is the reality of intensive care: at any point, we are as apt to harm as we are to heal. Line infections are so common that they are considered a routine complication. ICUs put five million lines into patients each year, and national statistics show that after ten days 4 percent of those lines become infected. Line infections occur in eighty thousand people a year in the United States and are fatal between 5 and 28 percent of the time, depending on how sick one is at the start. Those who survive line infections spend on average a week longer in intensive care. And this is just one of many risks. After ten days with a urinary catheter, 4 percent of American ICU patients develop a bladder infection. After ten days on a ventilator, 6 percent develop bacterial pneumonia, resulting in death 40 to 45 percent of the time. All in all, about half of ICU patients end up experiencing a serious complication, and once that occurs the chances of survival drop sharply. It was another week before DeFilippo recovered sufficiently from his infections to come off the ventilator and two months before he left the hospital. Weak and debilitated, he lost his limousine business and his home, and he had to move in with his sister. The tube draining bile still dangled from his abdomen; when he was stronger, I was going to have to do surgery to reconstruct the main bile duct from his liver. But he survived. Most people in his situation do not. Here, then, is the fundamental puzzle of modern medical care: you have a desperately sick patient and in order to have a chance of saving him you have to get the knowledge right and then you have to make sure that the 178 daily tasks that follow are done correctly — despite some monitor's alarm going off for God knows what reason, despite the patient in the next bed crashing, despite a nurse poking his head around the curtain to ask whether someone could help "get this lady's chest open." There is complexity upon complexity. And even specialization has begun to seem inadequate. So what do you do? The medical profession's answer has been to go from specialization to superspecialization. I told DeFilippo's ICU story, for instance, as if I were the one tending to him hour by hour. That, however, was actually an intensivist (as intensive care specialists like to be called). As a general surgeon, I like to think I can handle most clinical situations. But, as the intricacies involved in intensive care have grown, responsibility has increasingly shifted to super-specialists. In the past decade, training programs focusing on critical care have opened in most major American and European cities, and half of American ICUs now rely on superspecialists. Expertise is the mantra of modern medicine. In the early twentieth century, you needed only a high school diploma and a one-year medical degree to practice medicine. By the century's end, all doctors had to have a college degree, a four-year medical degree, and an additional three to seven years of residency training in an individual field of practice — pediatrics, surgery, neurology, or the like. In recent years, though, even this level of preparation has not been enough for the new complexity of medicine. After their residencies, most young doctors today are going on to do fellowships, adding one to three further years of training in, say, laparoscopic surgery, or pediatric metabolic disorders, or breast radiology, or critical care. A young doctor is not so young nowadays; you typically don't start in independent practice until your midthirties. We live in the era of the superspecialist — of clinicians who have taken the time to practice, practice, practice at one narrow thing until they can do it better than anyone else. They have two advantages over ordinary specialists: greater knowledge of the details that matter and a learned ability to handle the complexities of the particular job. There are degrees of complexity, though, and medicine and other fields like it have grown so far beyond the usual kind that avoiding daily mistakes is proving impossible even for our most superspecialized. There is perhaps no field that has taken specialization further than surgery. Think of the operating room as a particularly aggressive intensive care unit. We have anesthesiologists just to handle pain control and patient stability, and even they have divided into subcategories. There are pediatric anesthesiologists, cardiac anesthesiologists, obstetric anesthesiologists, neurosurgical anesthesiologists, and many others. Likewise, we no longer have just "operating room nurses." They too are often subspecialized for specific kinds of cases. Then of course there are the surgeons. Surgeons are so absurdly ultraspecialized that when we joke about right ear surgeons and left ear surgeons, we have to check to be sure they don't exist. I am trained as a general surgeon but, except in the most rural places, there is no such thing. You really can't do everything anymore. I decided to center my practice on surgical oncology — cancer surgery — but even this proved too broad. So, although I have done all I can to hang on to a broad span of general surgical skills, especially for emergencies, I've developed a particular expertise in removing cancers of endocrine glands. The result of the recent decades of ever-refined specialization has been a spectacular improvement in surgical capability and success. Where deaths were once a double-digit risk of even small operations, and prolonged recovery and disability was the norm, day surgery has become commonplace. Yet given how much surgery is now done — Americans today undergo an average of seven operations in their lifetime, with surgeons performing more than fifty million operations annually — the amount of harm remains substantial. We continue to have upwards of 150,000 deaths following surgery every year — more than three times the number of road traffic fatalities. Moreover, research has consistently showed that at least half our deaths and major complications are avoidable. The knowledge exists. But however supremely specialized and trained we may have become, steps are still missed. Mistakes are still made. Medicine, with its dazzling successes but also frequent failures, therefore poses a significant challenge: What do you do when expertise is not enough? What do you do when even the super-specialists fail? We've begun to see an answer, but it has come from an unexpected source — one that has nothing to do with medicine at all. Excerpted from The Checklist Manifesto by Atul Gawande. Copyright 2009 by Atul Gawande. Published in 2010 by Henry Holt and Co. All rights reserved. This work is protected under copyright laws and reproduction is strictly prohibited. Permission to reproduce the material in any manner or medium must be secured from the publisher. "The goal of the Safe Surgery Saves Lives Challenge is to improve the safety of surgical care around the world by ensuring adherence to proven standards of care in all countries. 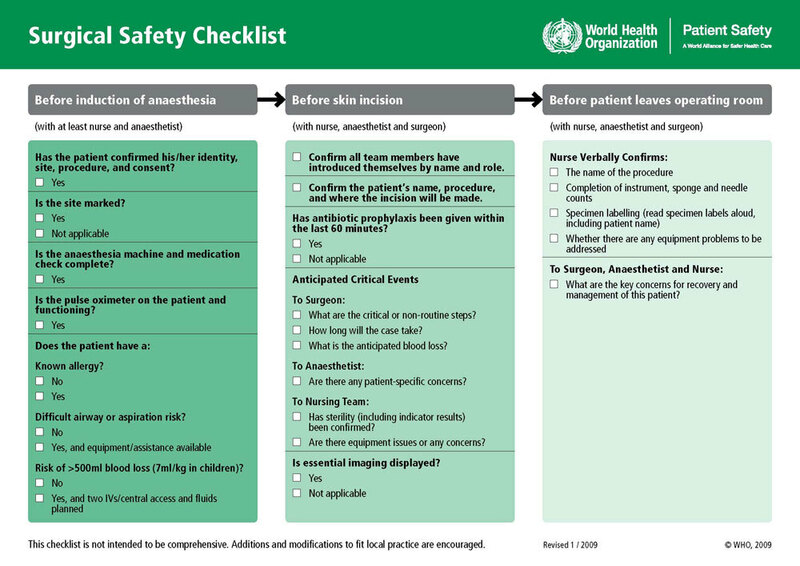 The WHO Surgical Safety Checklist (above) has improved compliance with standards and decreased complications from surgery in eight pilot hospitals where is was evaluated."